Your engine valves are designed to open and close at just the right moment, allowing the engine to run efficiently no matter what speed you’re driving the vehicle. Here in Vancouver, Ron’s Auto and RV are the leading experts in engine maintenance, including engine valve adjustment and valve cleaning. Yes, your valves are moving parts and can become off kilter, bent and broken requiring an engine valve adjustment or replacement. Below is a list of a few things that could happen and leave you in need of an engine valve adjustment. 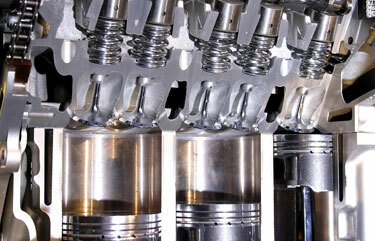 One way to extend the life of your valves is to have them regularly cleaned. Because these valves can build a thick layer of debris we do not suggest someone handling the cleaning themselves, as very strong chemicals are used during the valve cleaning and it is often a messy project. How will I know I need an engine valve adjustment? Valves are a part of your engine some signs to look out for are smoke, noises coming from under the hood, and a general loss in power. If you’re unsure whether or not you need an engine valve adjustment or a valve cleaning make an appointment with Ron’s Auto and RV today and our master mechanics can do a thorough inspection to determine what’s best for you and your vehicle.